On May 23rd, from 3:00 to 6:00 p.m, at the Raytown EMS building, located at 10020 E. 66th Terr., Raytown EMS staff will be hosting a drive-up/drive-thru car seat event in celebration of EMS Week. Nationally certified Child Passenger Seat Technicians will be conducting inspections and installations of child safety seats. No appointment is necessary during this event, but it is recommended that caregivers know the weight and height of the children if they are not present. It is also recommended to bring the vehicle manual and child safety seat manual. Questions can also be answered regarding the proper seat for a child’s size and when they are able to use a booster seat or seatbelt only. Please join us to keep our children and community safe! Raytown EMS will be holding a Heartsaver CPR/AED & First Aid Class on March 23rd, 2014 from 1pm-6pm at the Raytown Emergency Medical Services building located at 10020 E. 66th Terr. Raytown, MO. 64133. American Heart Association Certified Instructors will teach First Aid, Adult CPR/AED, Child CPR/AED, Infant CPR, & how to treat a choking Adult/Child/Infant. Includes book & course completion card. Call for current price per person. 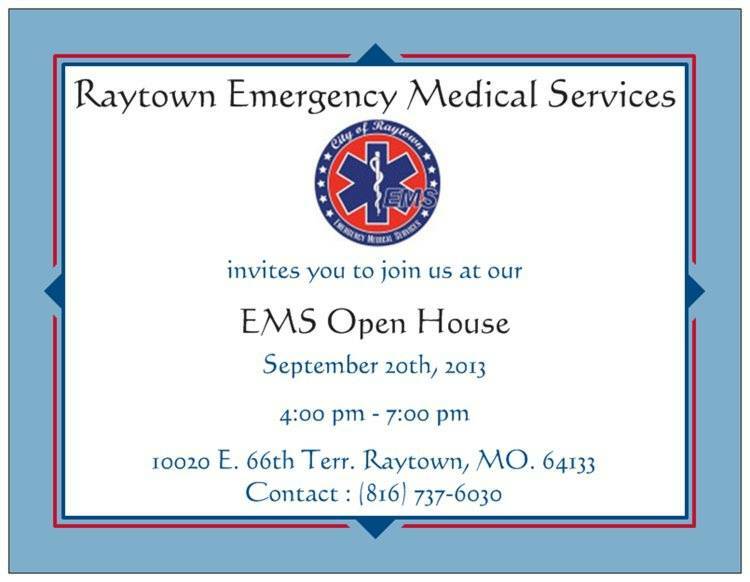 Please, email emsedu@raytown.mo.us or call (816)737-6030 if you would like to attend, or have questions. On Tuesday, October 8, the Missouri Bureau of Emergency Medical Services performed their mid-term audit and the Department passed with NO corrective actions specified. The audit reviews compliance with regulations applicable to licensed ambulance services, and is conducted at approximately thirty month intervals. These audits are performed by the Bureau of Emergency Medical Services of the Department of Health and Senior Services. 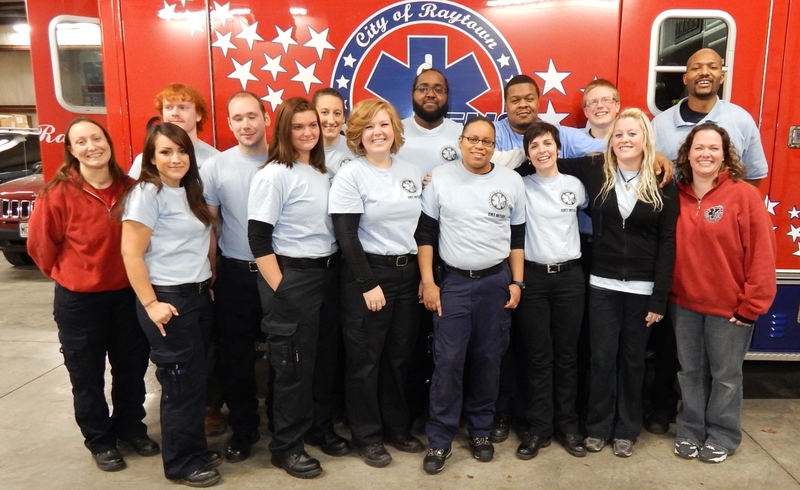 Raytown EMS is an advanced life support ambulance service dedicated to the City of Raytown. The service has been in operation since July 4, 1976. The ambulance fleet consists of two vehicles staffed and equipped to respond to emergencies 24 hours a day; a third ambulance can be staffed in the event of disaster, or for special events. Each ambulance is equipped with Opticom technology making responses to incidents safer and faster. This technology and all three ambulances were improvements made possible by the Capital Sales Tax. 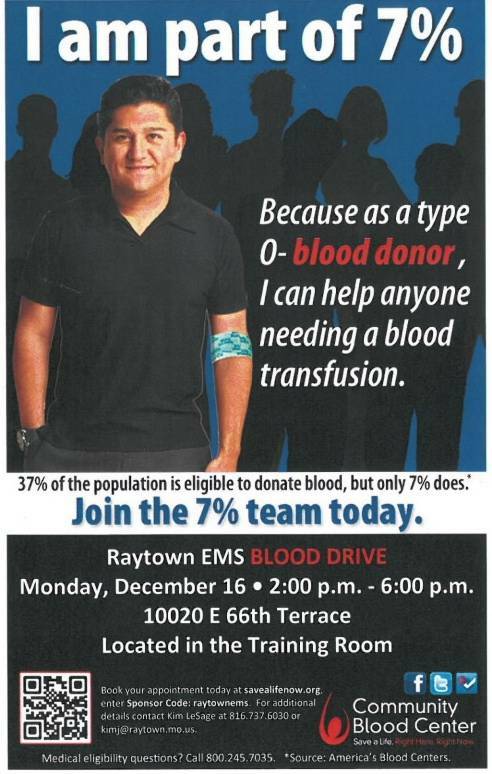 Community Blood Center blood drive to be held at Raytown EMS in the training room, 10020 E. 66th Terr., on Wednesday, August 28th from 3:00 p.m. to 6:00 p.m. To make an appointment online go to www.savealifenow.org and use Sponsor Code raytownems. You may also contact Kim at (816) 737-6030 with questions or to schedule an appointment. Register to donate and enter to win a Disney World Family Adventure! 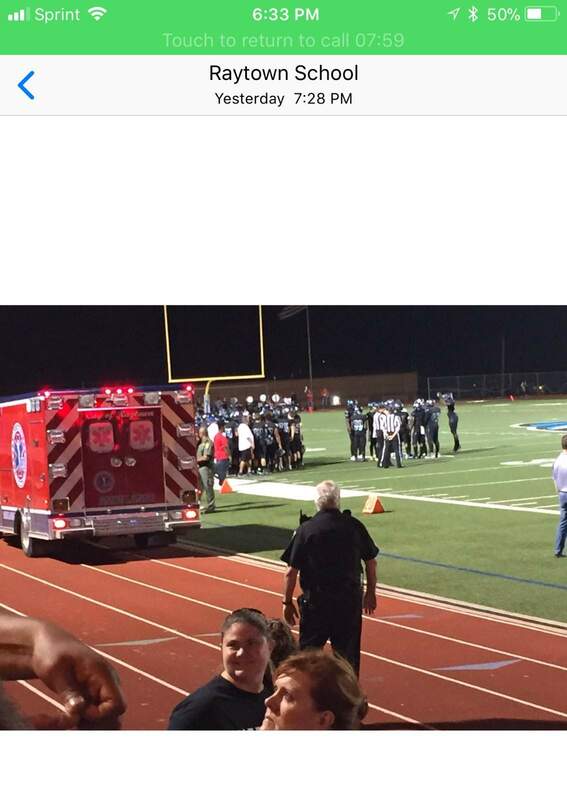 Take the opportunity to help save lives in your community! The Kansas City Community for All Ages and the Kansas City First Suburbs Coalition (City of Raytown is a member of both of these) has produced two publications that will help people age in place. The Community for All Ages Idea Book provides useful information to help individuals and their caregivers navigate the coming changes in health and lifestyles with special emphasis on home design and maintenance, housing options, and assistive technologies. The Kansas City Community For All Ages Coalition (made up of MARC, KC First Suburbs and KC Communities for All Ages) provides a toolkit that provides strategies to improve facilities and services for older adults and improve the quality of life for all residents. These strategies include improvements to community design, housing choices, local transportation, pedestrian environment, community services, programs for healthy living and civic engagement. John Benson and Brenda Gustafson attended the Truman Heartland Community Foundation Committee on Mobility/Transportation Eastern Jackson County Coalition. The goal of this committee is to ensure that seniors have access to affordable transportation services so their mobility and independence is not unduly limited when they decide they do not wish to drive or are unable to drive. We, along with the cities of Blue Springs, Independence and Lees Summit discussed what is currently available and what needs to be looked at for the future. This committee will participate in the MARC Older Adult Transportation and Mobility Summit on August 29th. John Benson and Brenda Gustafson attended the second Farmers Market Planning Committee Meeting on July 31st. Alderman Emerson, Alderman Ertz and Alderman Mock were in attendance. The committee continues to work towards a 2014 Farmers Market for Raytown. Management structure and location were the main topics of this meeting. Our next meeting will be August 7th at 3:30 p.m. in the council chambers. The tower behind City Hall continues to develop. The footings for the tower and the equipment building have been set. Last Thursday was the ground breaking for the new Habitat for Humanity House. The footings and foundation walls were poured this week. The Toast to Our Towns Annual Gala Save the Date was received. The event will be held at the Sheraton Kansas City Hotel at Crown Center on Saturday, September 7, 2013. Raytown’s Citizen of the Year is Terry Landers. Bridget McCandless, M.D. will be honored as the Heartland Humanitarian of the Year, Silverstein Eye Centers, Heartland Corporate Citizen of the Year and Cliff Jones, Dr. Paul M. Thomson advisor of the Year. Planning and Zoning held a meeting August 1st. They unanimously recommended approval of a conditional use permit for a pre-owned automotive sales business at 10004 Highway 350 subject to certain conditions. The department continues to promote our Spring/Summer Newsletter located on our Website to the citizens of Raytown. A free online directory dedicated to providing seniors and their caregivers with easy access to quality information and resources called CareConnection is available careconnection.mymcpl.org. This directory was developed in partnership with Truman Heartland Community Foundation, Mid-Continent Public Library and Shepherd’s Center Central. Raytown EMS will be collecting school supplies for their annual Back to School Supply Drive. Residents may drop off supplies at the EMS office located at 10020 East 66th Terrace, Monday through Friday 8:00 a.m. to 5:00 p.m. EMS will collect supplies until August 9, 2013. All items collected will be sent to REAP to distribute to local children who are in need. August 5 – Municipal Court – 6:00 p.m.
August 6 – Board of Aldermen Meeting – 7:00 p.m.
August 7 – Farmers Market Meeting – 3:30 p.m.
August 8 – BZA Meeting – 7:00 p.m.
Good afternoon. I would like to address an article that was posted on the 14th of July regarding Raytown Fire Dispatching and the EMS proposal. While well written there are a few points that need corrections. There have been several numbers that have been floated about the payment that the Raytown Fire Protection District was making to the City for dispatching services by the Raytown Police Department. The actual fee agreed upon by both sides was $50,000.00 per year. You are correct that even though the Raytown Fire Protection District is no longer paying this fee the duties of the Raytown Communications Center have changed but not diminished. Regarding the paragraph about how dispatching is routed to the Police Communications Center, the following is the correct summation of how this is handled. 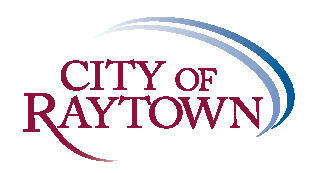 The Raytown Police Department is the Public Safety Answering Point (PSAP) for the City of Raytown. All 9-1-1 calls are routed to it through a selective router based on two things: a physical address or the location of the device placing the call. If the call is from a land line it is sent to the AT&T selective router which then looks at two items to determine where to send the call: The ANI (Automatic Number Identification) and the ALI ( Automatic Location Identification). ANI corresponds to the subscriber’s seven digit telephone number and ALI provides for an address display of the subscriber calling 9-1-1. The ALI display includes the subscriber’s address, community, state, type of service and name. If the call is from a cell phone it is routed through the Mid-America Regional Council (MARC) wireless router based on the latitude and longitude that are displayed. There are two different types of technologies that are used based on the type of handset technology that each wireless carrier has decided to utilize for their company. One type of handset uses the triangulation method which utilizes three towers to determine a location, while the other uses GPS technology that is located within the handset device to display the position of the caller. The FCC requires wireless service providers to be within 50 to 300 meters of the handset location depending on the type of technology used by that carrier. When a 9-1-1 call is connected to the Raytown Communications Center, a Communications Officer will answer the phone, ask a series of questions to determine what type of response is needed, and then either dispatch the appropriate unit or transfer them to the Kansas City Fire Department if it is a Fire incident. The transfer process takes less than a minute to complete, depending on the amount of time that the Kansas City Fire Department needs to answer the 9-1-1 call. Once at The Kansas City Fire Department it is placed in a queue for actual dispatching. Before the change in service was initiated by the Raytown Fire Protection District, the Raytown Communications Center would gather all of the information, dispatch all necessary units at the same time and respond to any request for additional resources necessary to support the response. With the current status of transferring calls to the Kansas City Fire Department, once the Raytown Communications Center delivers the 9-1-1 call to the Kansas City Fire Department the call is disconnected so that Kansas City Fire dispatchers can gather the information and send the appropriate units to the call. This could be a Raytown unit or a Kansas City Fire Department unit depending on which one is closest to the location. If further assistance is needed from any Raytown Emergency responders , the Kansas City Fire Department must place a telephone call to the Raytown Communications Center to request Police or EMS be dispatched to assist them. This slows down the necessary response of units to an incident. I appreciate being able to respond to your article and I would be happy to sit down with you to discuss dispatching further. If you would like a tour of the Raytown Communications Center please let me know. that I look forward to discussing with my Aldermen and the entire Board. the RFPD, but I’m hoping to find out soon. I want to urge the citizens of Raytown not to take this matter lightly. payers money and the potential changes in services being provided. * Editor’s note: Mr. Bledsoe did email a copy of the document that he obtained before the document was released on the Fire Districts blog. The document linked in the previous post is the Fire District’s blog version. It was chosen as it is not a scanned copy of the document and therefor clearer. The President of the Raytown Fire Protection District (Robert Palmer) submitted a proposal to Mayor Bower on April 13th, 2013. The proposal advocates the transfer of the City of Raytown’s Emergancy Medical Services to the Fire District and includes pages of support data. This document has not been available to the public until recently and was posted on the Fire District’s blog June 11th at 5:25 pm. A local resident who was requesting the document was referred by the City to the Fire District. The Fire District refused release until recently, citing that the document was still under review by the District’s lawyer to decide if it fell under the Sunshine laws. Click HERE to read the proposal in PDF format. 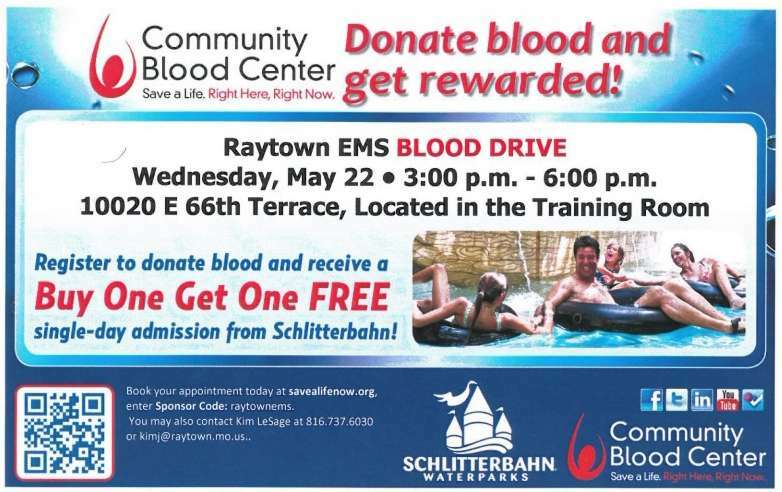 Community Blood Center blood drive to be held at Raytown EMS in the training room, 10020 E. 66th Terr., on Wednesday, May 22nd from 3:00 p.m. to 6:00 p.m. To make an appointment online go to www.savealifenow.org and use Sponsor Code raytownems. You may also contact Kim at (816) 737-6030 with questions or to schedule an appointment. Buy-one-get-one free Schlitterbahn vouchers will be offered to anyone coming in to donate blood. 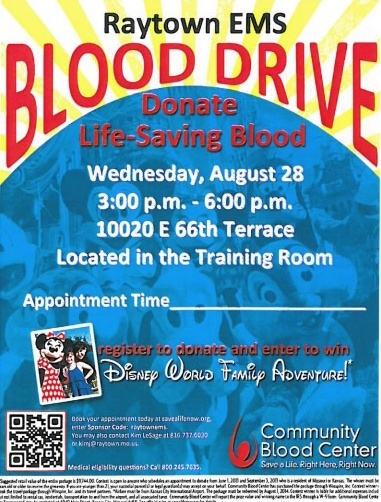 Take the opportunity to help save lives in your community! 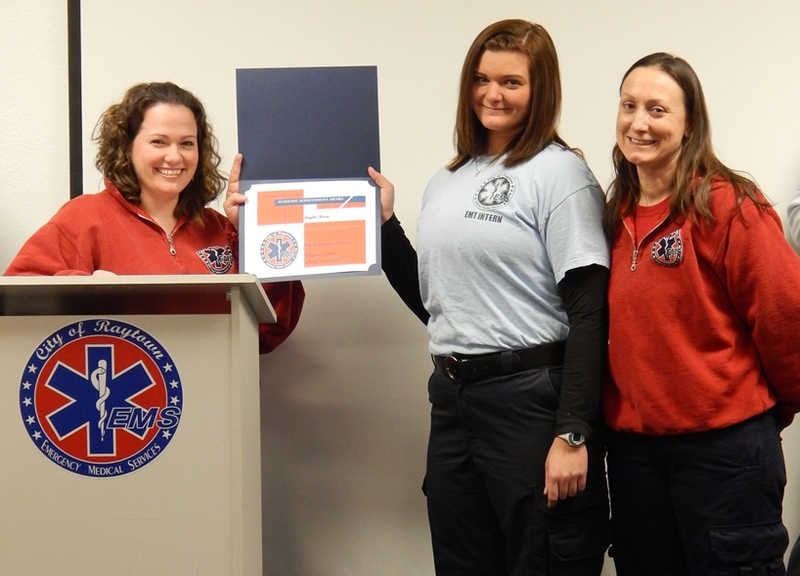 In celebration of EMS Week, Raytown EMS employees will be holding several community service and education events. On May 21st from 12:00 to 5:00 p.m, at the Raytown EMS building, located at 10020 E. 66th Terr., Raytown EMS staff will be hosting a drive-up/drive-thru car seat event. 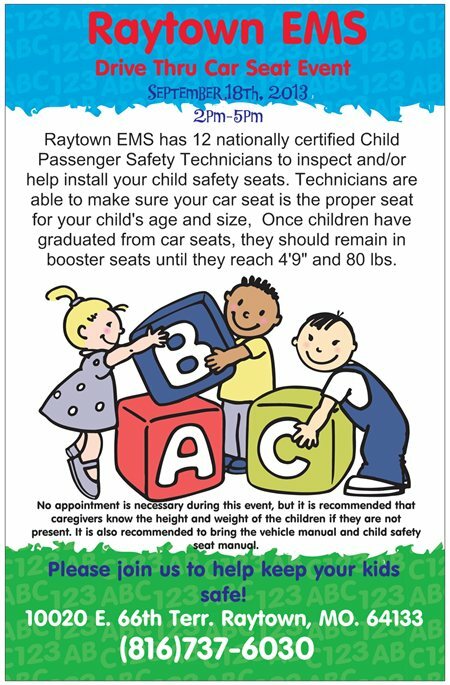 Nationally certified Child Passenger Seat Technicians will be conducting inspections and installations of child safety seats. No appointment is necessary during this event, but it is recommended that caregivers know the weight and height of the children if they are not present. It is also recommended to bring the vehicle manual and child safety seat manual. Questions can also be answered regarding the proper seat for a child’s size and when they are able to use a booster seat or seatbelt only. Please join us to keep our children and community safe!